After travelling south for two long days, staying at St George the first night, then the second night at Narrabri, we then headed for Coolah and booked in for two nights. Coolah was a nice little park, with happy hour around a blazing fire, lit in a huge mining drum. This meant we had a good break, as well as being able to spend a day in the Coolah Tops National Park, which was well worth the visit. The temperatures are very low in these towns (4+ 17 degrees) and we are back in jeans, socks, boots and coats. In the National Park the highest temperature for the day was 10 degrees! Russ lit a fire and we had the most delicious steak sandwiches, with onion, lettuce, tomato, cheese and sauce. 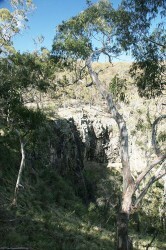 Russ went for a walk to Norfolk Falls, not much water going over because of the dry weather. The forest is full of tall, straight eucalypts and tussock grass and there are a number of well designed camping areas, all with toilets, fireplaces and tables. In certain parts of the forest, there are stands of snow gums, much taller than in the Victorian high country. We also visited Brackens Hut, which was an out station used during summer when sheep were grazed on the alpine grasses and herbs. 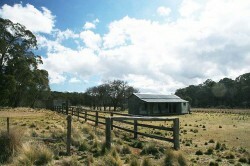 However in the 40s and 50s two families lived here, one family of five, the Brackens, spent 11 years in this 3 roomed hut. 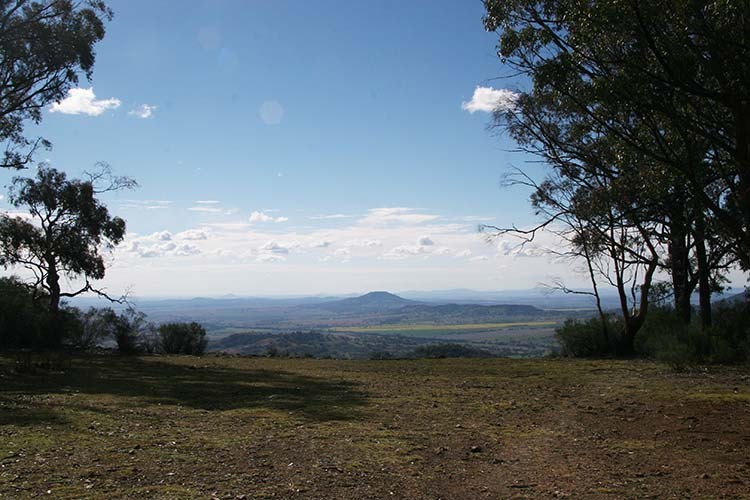 We also went to the Pinnacles to see the wonderful views over the Warumbungle and Liverpool Ranges, but it was a bit misty in the distance. It was a very enjoyable day and Coolah Tops National Park is well worth a visit. We had a short drive today to Mudgee, where we will stay for three nights. I was hoping to get my hair cut, but I wasn’t able to get in anywhere. There are a lot of wineries here, a very large town with interesting restaurants and cafes and Munghorn Gap Nature Reserve. Rain is forecast, so whether we BBQ there will be dependant on the weather.